Before the internet and in its infancy, magazines were the best source of information for many subjects. I bought many different titles and several are no long printed. I thought I would list some of them and give my opinion on them. Another Amercian magazine I bought in the UK, YIL as it was abbrieviated to, was a computer and internet culture magazine. Film critic Roger Ebert had a regular column called Critical Eye and in this issue it was about keeping sites simple so they would download quickly. Remember that accessing website with a 14400 modem was the norm at the time, so flashy graphics and Java applets could add minutes to a page loading. The first thing you see is the site address guide, which you can tear out and keep as a reference. In the Cool Tools section, new equipment include the Nikon Coolscan 2000 at $1,899 and Clik! disks (40MB storage) at $9.95 each. 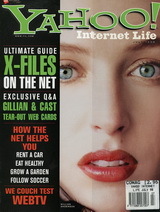 There's a section about the X-Files, with an interview with Gillian Anderson, nine bookmark cards with X-Files links and other related information. There's an article on WebTV and reviews of new websites with AOL keywords. The last page is called Pretty Strange, and lists six odd websites, like Kill the Whales Foundation, the Mr T Quote of the Week and the Darwin Awards, which are awarded posthumously to people who accidentely kill themselves while performing stunts of pure idiocy. 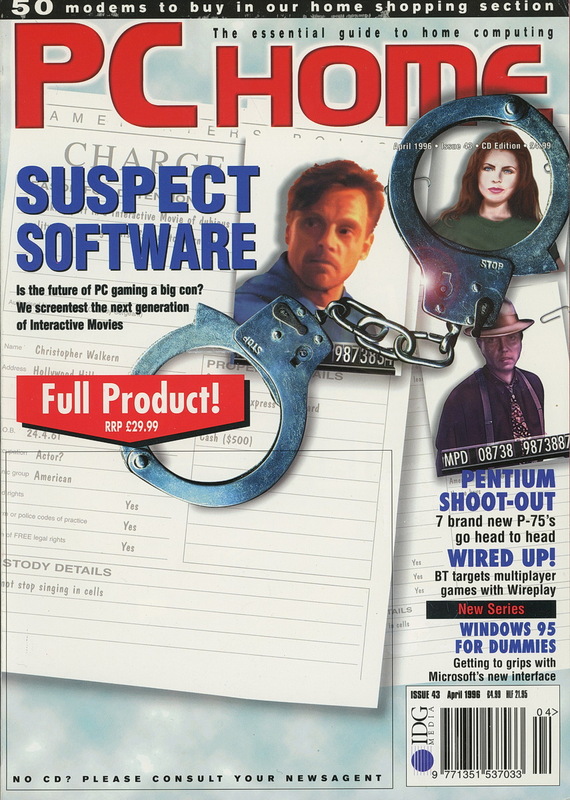 The magazine cost £2.95 ($2.99 US) and adverts include the Intel Pentium II/Celeron processors and the Adfa SnapScan EZ scanner at $149. 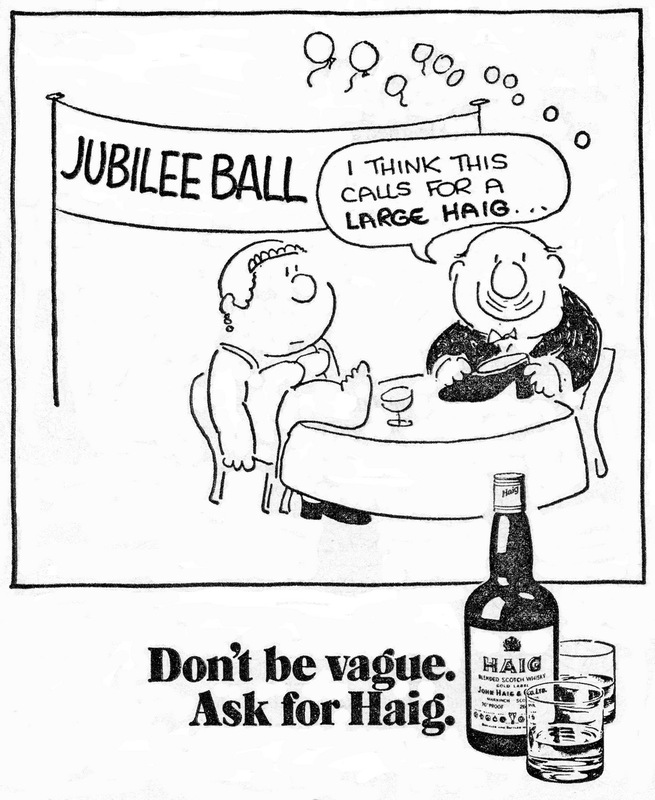 Tagged with 'find what you want on the Web', this was a web site listings magazine. 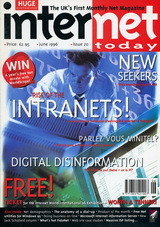 There are many articles with themes to types of websites, and in this issue their awards for the year 2000. Winners include Google as the best search engine, Amazon as the best e-commerce site, Yahoo as the best portal and the Internet Movie Database as the best film/tv site. The listings only start on page 80 and are divided into sections like television, sport, celebrities, travel, money, health, comedy, learning, kids, games, history and weird. There's a feature on this new sound format MP3 and in the step-by-step section there's a list of internet providers, hardware, like the HP DeskJet 880C for £179, web browsers, email and newsgroups. The magazine cost £2.50 and adverts are only for websites, including BlueSQ (betting site), Confetti (a UK wedding site), Autosport (motor racing news) and Ebay. 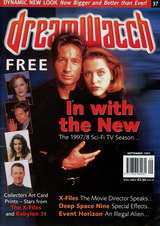 This magazine features science fiction and fantasy on screen and TV, much like TV Zone or Cult Times. The TV News section reported on a new show Stargate SG-1, Star Trek: Voyager new series introducing Jeri Ryan and Sabrina Lloyd quitting Sliders before the fourth season. Film news reports on a remake of the Wild Wild West (with Will Smith and George Clooney), the new Star Wars prequel called The Balance of the Force and a new Incredible Hulk film with three supevillains and Johnny Depp offered the Bruce Banner role. There's an interview with Jeff Conaway about his role in Babylon 5, Barry Sonnenfeld about Men In Black, the making of Deep Space Nine and the revival of The Outer Limits show. The archives section features Sylvester McCoy as Doctor Who, the original Supevman TV series and the Close Encounters film. 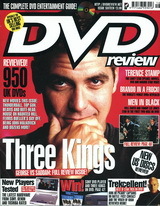 The review include many videos and books, plus two TV series, The Pretender with Michael T Weiss and Andrea Parker (no, I don't remember either) and Space Cadets, a quiz with Greg Proops, Craig Charles and Bill Bailey. The magazine cost £2.95 and adverts include a tape of Beyond Belief, starring Tom Baker and Donald Pleasence for £11.99 and the Star Trek tridimensional chess set with silver and gold plated pieces, at £145. 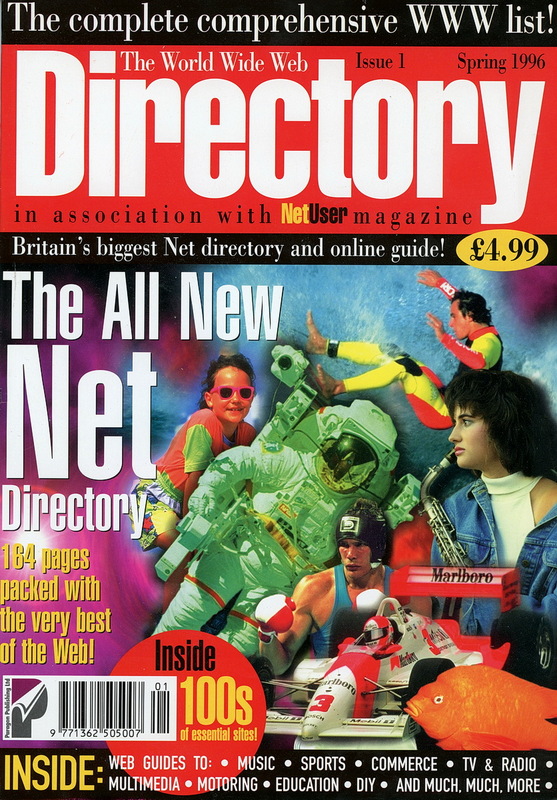 Tagged 'The UKs first monthly net magazine', this internet magazine was more technical than other magazines. 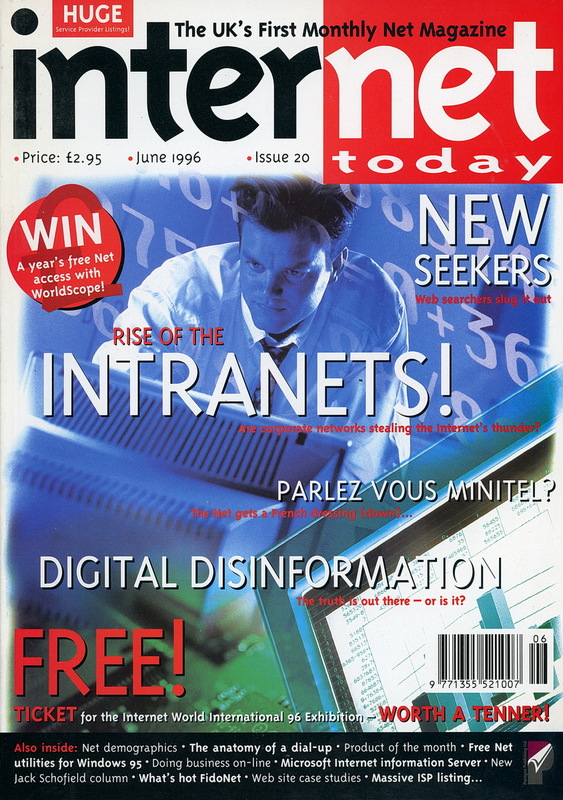 Along with News and Mailbox (letters) page, this issue had articles on Intranets, data encryption in the US, search engines (7 listed, and Google wasn't one of them), Help Desk, Service Providers (with a breakdown of services, costs, telephone number, etc.) and a Directory. Out of the 116 pages of the magazine, only 10 are dedicated to the directory. Of the reviews of software, I only recognise one, Forte Agent, which was used to access Usenet newsgroups. 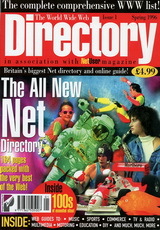 The magazine cost £2.95 and adverts include CompuServe membership, first month free with 10 hours access, then £6.50 per month with 5 hours free online time and Direct Connection Capital Account (£10 per month) or UK Account (£15 per month) plus £7.50 one time joining fee plus VAT and 500K web space. 'The essential guide to home computing', PC Home was one of several magazines (PC Answers, PC Format, PC Gamer, etc.) of that type. It included a cover CD (or two HD floppies), with lots of game demos and shareware software as well. The Home Front (or news section) has plenty of items but none are too long. There is a article on Interactive Movies on CD, which include Urban Runner, Ripper, The Darkening and a checklist of some others, like The 7th Guest, Return to Zork and Under a Killing Moon. There's a selection of 75MHz Pentium PCs on review, and some home designing software. The software reviews vary in length, sometimes four on one page, and one piece of software, Get Ready for School Snoopy, is reviewed by several different readers. The game section has big reviews on Wing Commander IV, Grand Prix 2 and Kingdom O'Magic, which is one of the demos on the CD-ROM. Some of the reviews are very short, down to half a page or even a quarter. The Home & Dry section gives a guide to several games and there's also some reviews of shareware. The Write Home (or letters) pages has some long letters, and there's a new series called Working 95, helping you get the most of Windows 95. The Home Help has some technical answers and the Buying Guide covers hardware and lists over 50 modems. The magazine cost £4.99 and adverts include the Sportster Vi 28,800 modem at £199 (excluding VAT) and the Hutchinson Multimedia Encyclopedia 1996 at £45.99. 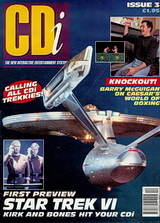 The third issue of this magazine, which was solely dedicated to the Philips CD-i system, has news and reviews of the new releases of games and films for the system. Early versions of the players required a DV cartridge to playback MPEG video, which gave the machine an extra 1.5MB of memory. This caused a delay on the release of some games like The 7th Guest and just to complicate matters, some films were released in the green standard, not the white standard of Video CD. I had a large collection of films and although I can watch any of the VideoCDs on a PC/DVD player, none of the CDi Philips Digital Video discs will play. 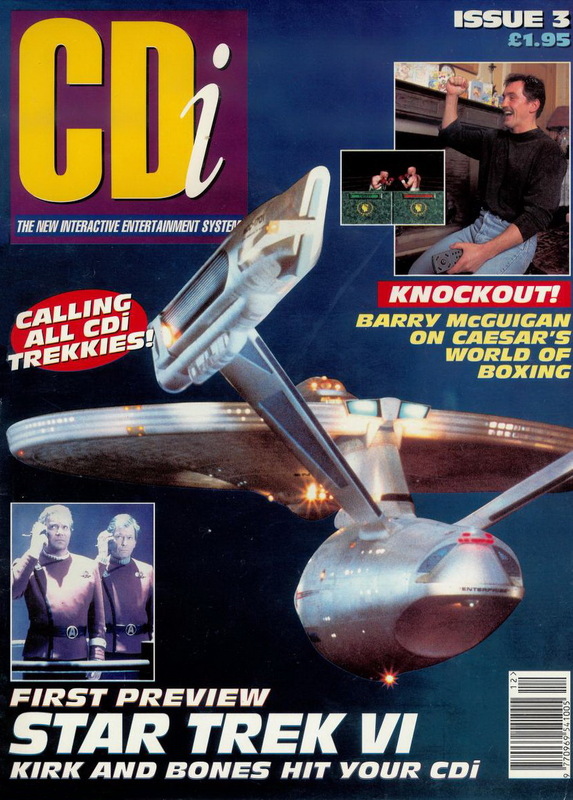 There's an interview with Barry McGuigan playing the interactive boxing game, Radio 1 DJ Nicky Campbell and Dominik Diamond play International Tennis Open, there's a preview of Bad Dog McCree and Space Ace and reviews of many other discs. There's a price list and catalogue of available discs, and a dealer directory. The magazine cost £1.95 and adverts include the Philips Portable Digital Compact Cassette player DCC 130 and the CDi 220 player at £339.99 with the digital video cartirdge costing £149.99. This is the first issue of the magazine, made ins association with NetUser magazine. The guide divides the sites into 16 categories, namely, Electronic Commerce, Visual Arts, Weird Web Sites, Natural History, Shopping, Kids' Stuff, Alternative Music, Marketing & Advertising, DIY, Sport, Music Making, TV & Radio, Multimedia, Freelance & Journalism, Motoring and Education. Each site has a score out of five stars, a screenshot and a small paragraph describing the site. Most of the screenshots are taken using Netscape, mostly on a PC, but a few are taken on a Mac and some use a different browser. Bear in mind that this was published in Spring of 1996, many of the sites look similar, namely a grey background and Times Roman font. Many of the sites are based on university servers, mostly US ones, although there are a few sites that are not. This means that the actual URL is very complex. For example, in the Kid's Stuff section, the Thomas The Tank Engine website (which scored 3 out of 5) is at http://www.catt.ncsu.edu/users/gkeeper/HTML/my.useless.pages/STS/index.html. It's no surprise that you need a magazine to find these sites! The magazine cost £4.99 and adverts include the Hewlett Packard 4031i 4x CD Reader/2x CD Recorder at £880.08 (yes, that price is correct) and U-Net easy internet access EasyOneIP package at £12 to join, then £12 pm or £100 pa, with a personal web page of 500K! 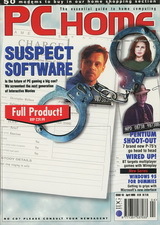 Tagged 'The world's best-selling PC leisure magazine', PC Format was the computer magazine that covered all bases, but didn't take itself seriously. It started off with a 5 and a quarter inch cover disc, going to two, then 3 and half inch floppy discs, then a CD-ROM and finallly a DVD-ROM. 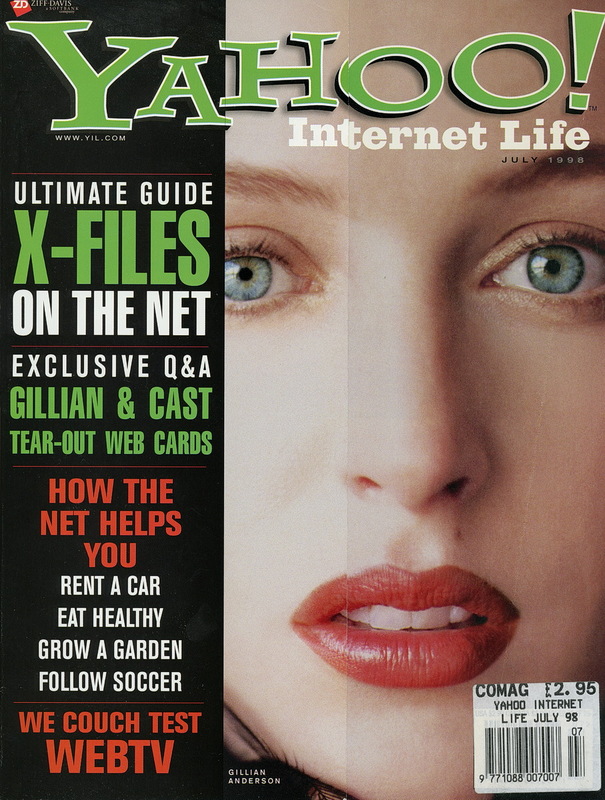 This issue came with 2 HD floppies or three CD-ROMs, and in the news section, Yahoo launched a UK & Ireland version of their search engine. 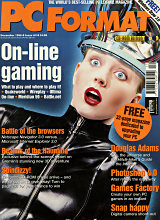 There's an interview with Douglas Adams, a report on online gaming, like Quake, a preview of Core Design/EIDOS's new game called Tomb Raider, reviews of 7 digital cameras, a testing of Netscape Navigator 3.0 vs Internet Explorer 3.0 and reviews of Photoshop 4.0, Cinemania 97 and Music Central 97. The competition is to win one of six 12-speed TEAC CD-ROM drives and on the discs are demos of Toonstruck, Tomb Raider, The Games Factory (save disabled), a shareware version of PaintShop Pro 4.1, CompuServe and a full version of Micrografx's Windows Draw 3.0, able to upgrade to version 5.0 for only £44.99. A Tips & Tactics section gives help with some games, and of course there's a letter page. 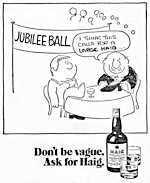 Near the back of the magazine there are quite a few mail order adverts for software and hardware, such as an IBM Thinkpad 760 ED with P133 processor, 16Mb RAM and 1.2Gb HD for £5700 and several bulletin boards. 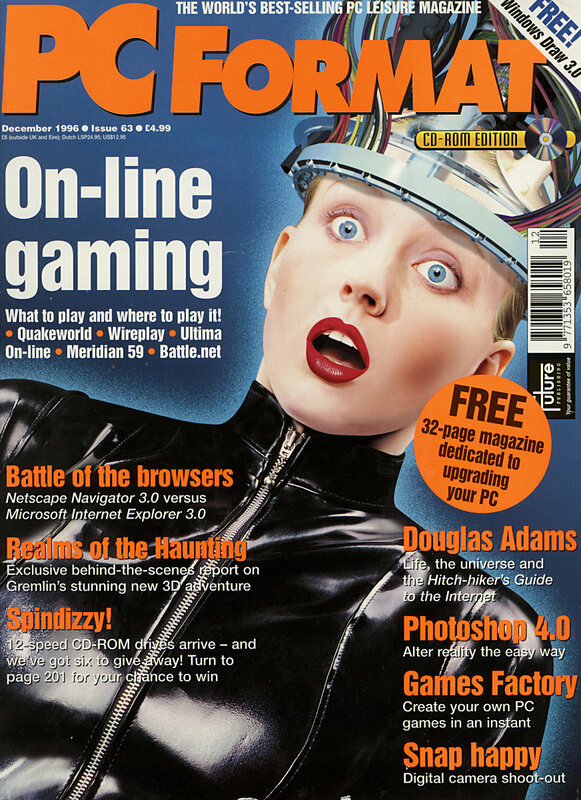 The magazine cost £4.99 and adverts include Microsoft Flight Simulator for Windows 95 at £39.99 from Woolworths and Casio's QV-10A Digital Camera at £349.99 excluding VAT. © 2015 Orchardoo.com. All Rights Reserved.